Blurb Description: Alex fights a daily battle to figure out the difference between reality and delusion. Armed with a take-no-prisoners attitude, her camera, a Magic 8-Ball, and her only ally (her little sister), Alex wages a war against her schizophrenia, determined to stay sane long enough to get into college. She’s pretty optimistic about her chances until classes begin, and she runs into Miles. Didn't she imagine him? Before she knows it, Alex is making friends, going to parties, falling in love, and experiencing all the usual rites of passage for teenagers. But Alex is used to being crazy. She’s not prepared for normal. Reading the synopsis of the book, I thought it would be a deep dark book on mental health exactly like Girl in Pieces by Kathleen Glasgow, and I went inside prepared for a fairly intense book. 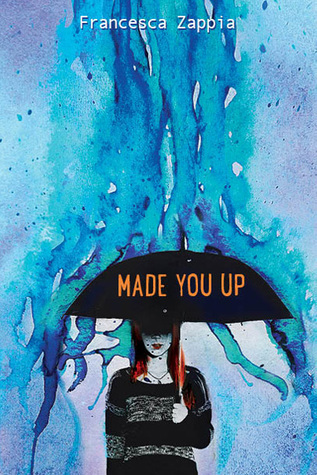 Made You Up was a really fun read, one that made me really believe in the romance like very few books do. It was about friendship and trying to function normally while also living with a debilitating mental disease. Francesca had an easy to read writing style. In fact, it was so easy to read, I finished the entire 400 page book in one day and I wanted more. It made the entrance into the world and especially Alex’s mind very east. I LOVED THE IDEA. I LOVE LOVE LOVED IT. A story about the confines of reality told from the schizophrenic’s point of view? And the girl suffering from schizophrenia is also trying to be a normal high schooler, get into college and fall in love? I NEEDED IT. I was going to import a copy for myself before Harper announced that they would be releasing it and I was over the moon. I LOVED this book. I loved Alex, I loved Miles and I loved everything about this story. It was fun, it was about to know it all high school teenagers whose conversations were filled with sass and dark humour and there was nothing not to love about it. I’ve never read a book told from a schizophrenic’s point of view, and I wasn’t sure what I expected really. The only schizophrenic’s I’ve seen are the few on Grey’s Anatomy, who have rather advanced cases but I assume that what Alex has was not so acutely onset. I honestly don’t know enough about the disease to make judgements, but I felt like it was treated a little lightly. Alex was trying a lot to be normal (which I respect and understand) but I felt like I learnt nothing more about the disease, in a book whose tagline was about said disease. I did love the chemistry between Miles and Alex, the club and even the high school conspiracy that also played around the book. It was a FUN book. Like I already said, I LOVED the dark humour and sass between Miles and Alex. I liked all the club misfits and Tucker. I really wish that Alex’s parents were more responsible about her condition. I wish her mother didn’t say she would throw her in an asylum. They were well developed, but again, I don’t feel like the people who were supposed to treat her disease with maturity didn’t and it annoyed me a little. A fun, light hearted, sass-filled book that will make you appreciate the reality you live in while making you crave the romance that it creates. 4 stars. YA writer represented by Louise Fury of the Bent Agency. MADE YOU UP (2015), ELIZA AND HER MONSTERS (now available). I like writing, reading, drawing, and scaring my friends. 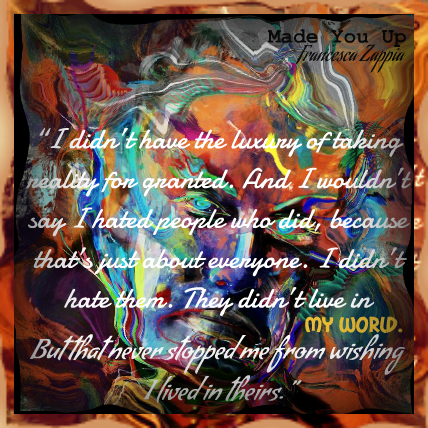 I'm on Twitter @ChessieZappia, Tumblr (http://exeuntstormtroopers.tumblr.com), Instagram @ChessieZappia, Pinterest (https://www.pinterest.com/francescaza...), and on my website, www.francescazappia.com. Have you read this marvel of a book? What do you think of Miles and Alex? What are some of the best books on mental health you've read? I can't wait to hear your recommendations!